IDF warns Gaza kites may be armed with explosives, considers using drones to shoot down flying firebombs. The IDF on Friday ordered security personnel in towns bordering Gaza to warn civilians not to touch any kites found, since they may be booby trapped with explosives, Channel 2 reported. According to another Channel 2 report, the IDF is also debating whether to raise the level of its response to the flying firebombs, which are let loose to fly into Israeli territory for the purpose of causing fires in agricultural areas. On Thursday, one such kite caused an enormous forest fire, which ten firefighting teams fought for hours to put out. Earlier this week, another kite burned an entire wheat field. The new response would aim to halt the kites and balloons before they cross into Israeli territory, as well as firing shots at rioters preparing and releasing the kites. 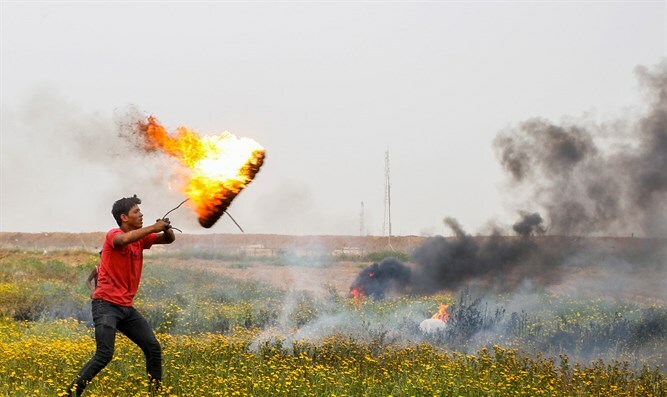 Head of Arabic Communications in the IDF Spokesperson's Office Avichai Edery on Thursday said, "The burning kite phenomenon is not something we don't see, and we consider it a very serious issue." "Residents of Gaza - Hamas is using you, and is dragging you into the circle of terror. On 'Workers' Friday,' as Hamas calls it, we suggest you stop working for Hamas and start making them work for you and solve your problems."